Newport, Oregon – The fleet that fishes for black cod, perch and other groundfish off the Oregon coast is a shadow of what it once was. And so are the fish stocks that it harvests and hauls into processors like those anchoring the historic waterfront here in Newport. But new rules are likely to change that. Each fisherman would be given a quota for his or her catch, and no time limit in which to fulfill it. If it sounds unremarkable, quotas could transform current practice by eliminating fierce competition and the “derby-on-the-sea” phenomenon that has, in the eys of some scientists, helped decimate several fish stocks. Here in Oregon, it will be the first time the system – called catch shares or individual transferable quotas – has been tried on the West Coast outside of Alaska. And it could provide long-term viability that a $25 million groundfish industry that under a decade ago was declared a federal disaster. The rules, devised by the Pacific Fisheries Management Council, are supported by the National Oceanic and Atmospheric Administration, which will wait until next summer to officially adopt them for implementation in 2011. But the shift in thinking has occurred already. Studies published last year and as recently as last week in the journal, Science, report bolstered stocks in some fisheries that have taken conservation steps, one of them implementation of individual quotas. And several voices in Oregon’s fishing community – both for and against – are heard assessing consequence. “There are a lot of fishermen who don’t want anything to do with this, because life is good for them the way things are,” said Dave Jincks, , an ocean trawler owner and Port of Newport Commissioner who supports catch shares. Shares will be allocated based primarily on a boat’s performance in the fishery between 1994 and 2003. So if your boat caught a lot of fish relative to others, your allotted share of the catch will be higher. This could hurt newer boats in the fishery that don’t have a long history of catching lots of fish, but have nonetheless been fishing well in recent years. While life is good for some fishermen, it’s a mess overall for the ocean trawling industry off Oregon’s coast. Like scores of ocean fisheries around the world, the groundfish fishery has suffered under the unsustainable equation of too many boats chasing too few fish. That led to some fish species getting nearly wiped out, prompting sharp and shifting government restrictions on fishing that are onerous to boat owners and fishing businesses seeking some predictability. The groundfish fishery encompasses over 80 species and is divided into two sectors – non-whiting and whiting – and can include offshore trawlers that land their catch in port, deep ocean catcher-processor boats and mother ship vessels that collect the catch from smaller boats. The new rules will mean different things for each sector of the fishery, but the basic premise of catch shares is simple enough. Whereas under old rules each boat in the fleet fought for the biggest piece possible of a total allowable catch for each species, leading to a rush to catch as many fish as possible before the seasonal cap was reached, under catch shares each boat is granted their own share of the total catch. It amounts to the privatization of a previously public resource. Catch shares gained greater favor last year after a paper published in Science reported that their implementation “halts, and even reverses, the global trend towards widespread collapse” of ocean fish stocks. And this year NOAA, led by former Oregon State University professor and oceans expert Jane Lubchenco, convened a task force to make recommendations for applying catch shares to more of the nation’s fisheries. “It seems like it’s a nexus between conservation and economics,” said Steve Murawski, chief science advisor for NOAA Fisheries.The agency’s report is due out by today. Despite the current popularity of catch shares, some groups are urging NOAA to proceed with caution in its embrace of the management tool. For one thing, divvying up the total allowable catch can’t restore fisheries if the total allowable catch is more than the fish stocks can bear. “Until we have a true commitment to set fishing levels that are sustainable, how you allocate it isn’t going to solve the problem,” said Rebecca M. Bratspies, a fisheries expert at New York’s CUNY School of Law. And since the individual quotas, or shares, are transferable, companies can buy them up, leading to consolidation in an industry that still allows an individual boat owner to make a living. 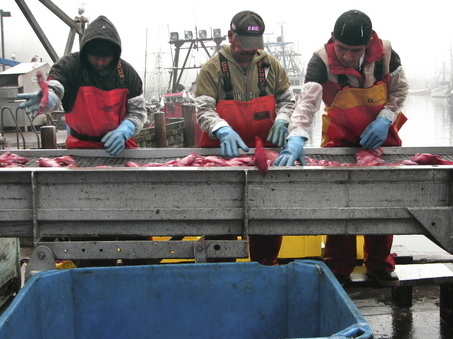 For that reason the groundfish catch share program sets limits, generally 3-15% percent, on how much of the total catch any one owner has right to. They’ll be monitors on each boat to see that its owner doesn’t exceed their quota. If someone goes over their cap, they will have to buy extra quota from another boat. And if they don’t expect to fish to their full quota, they can sell or lease their excess on the open market. The cost of monitors and other parts of the program once it’s implemented in 2011 is expected to cost between $2.4 and $2.9 million a year, and the fishing boats in the program will bear the brunt of the cost. And some boat’s quotas may be so small that they choose to simply lease their quota to another boat, leading to a phenomenon called “armchair fisherman,” which the group Ecotrust Canada says have become commonplace in catch share fisheries in British Columbia. “I’m concerned we will see in the play out of the groundfish fisheries some of the same problems we saw in British Columbia,” said Ed Backus, vice president for fisheries for Ecotrust’s Portland office. NOAA recently released preliminary figures for what percent of the catch each boat in the program could get. Jim Seavers, who has been fishing out of Newport for three decades, keeps the rows of figures in a small binder, and he’s circled in bright highlighter the percentages and pounds allotted to the three trawlers he owns or manages. One, the Miss Sue, is set to get about .5% of the traditional groundfish catch, or 313 metric tons, and about 2.7% of the whiting catch, equal to 1,147 tons. This week the Miss Sue loaded up with fuel, ice and provisions before heading out again to fish. Seavers is hopeful the catch shares program will eliminate waste in the fishery and bring some predictability to the regulations that manage it. But he worries about the extra cost each boat will have to bear to pay for the program. Seavers had experience in a catch share fishery in Alaska, which he said has overall had positive effects. But he warns the groundfish fleet could face further reductions – it’s down to fewer than 170 boats from close to 500 in the 1990’s – even as it reduces waste.